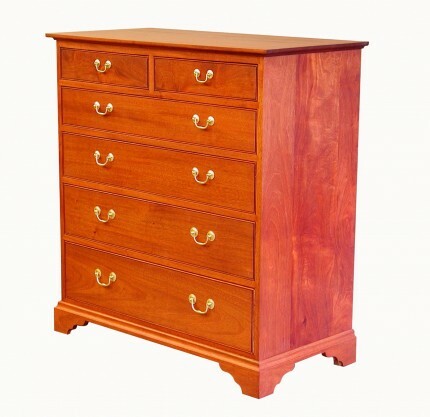 A classic chest of 6 drawers in Mahogany. With hand-cut dovetail drawers. I built this piece to sell in an artisan gallery I was once a part of. At the time I had a good stack of mahogany boards I had acquired from the widow of a local woodworker. He unknowingly made her a tidy profit on that pile of lumber. I somewhat followed the lines of an antique chest that my wife uses. The hardware is solid brass reproduction furniture jewelry. The construction is traditional sliding dovetail carcase, mortice & tenon frames with dust boards and hand-cut dovetail drawers.